Unique control system offers virtually infinite control over process parameters. Good part yield performance with no touching parts to wear out or be replaced below the molten magnesium surface. 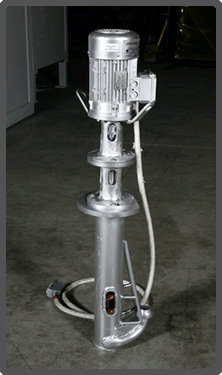 The MetaPump magnesium features a removable Nozzle for easy cleaning and a non-wetting refractory pouring nozzle. Metamag's new MP4-MG Magnesium transfer Pump has been engineered for efficient, reliable and trouble-free magnesium pumping over long duty periods. The True' alignment axis ensures centering of bearings and screw drive at higher speeds that reduces vibration and premature wear of the moving parts. The new generation magnesium pumps also feature technological advances in intake and sludge control while the pump is operational. The heart of the magnesium pump uses our patented and proven liquid mg displacements technology and double pitch closed helcoids screw and ventury type outlet that reduces the risk of clogging. The Metamag Magnesium MP4-MG magnesium pump is designed to produce a 30% increase in total output and provide improved operational efficiency. Faster, easier rebuild lowers operating costs and system downtime.